Crossfire used to be one of my favorite shows. Yesterdays show was an example of why it was cancelled. Crossfire was once one of my favorite shows, however yesterdays show was a good example of why it was cancelled. The republican debate strategy is not to respond to any questions but to keep on repeating their assigned talking points, interrupt the other guest every time the other person speaks so they cannot make a point. Michelle Bachmann was great at this strategy. In the last few years we have heard her make some stupid statements proving she really is the air head we thought she was. Here is my suggestion, let them know they will get equal time and when one tries to interrupt cut their mike. If they continue to repeat talking points DON'T invite them again. It's your show CNN but if this garbage you aired yesterday continues I will stop watching. If I want to watch loud shouting matches I'll visit my in laws. 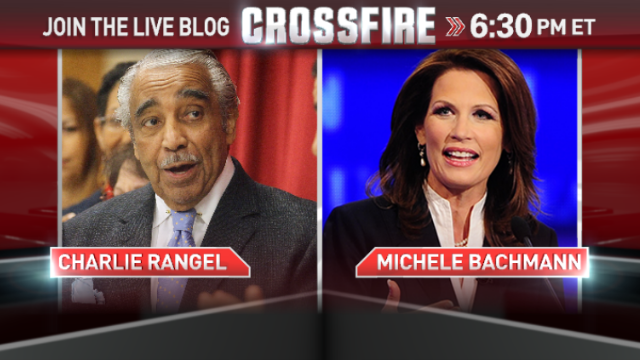 I justed wanted to say how absolutely disapointed I am that CNN would have Michelle Bachmann on Crossfire. I've always respected CNN, however now I"m starting to worry. Are you turning into Fox?? Michelle Bachman is full of so many untruths. I turned off the tv the minute I saw her. I will never watch Crossfire again. I/m sorry but after so many incorrect and ludicrous statements by Michelle Bachmann, I find it difficult to take the time to listen to her debate anyone. She is a nut case. If only one could listen to what people are responding to I would stay on the Channel, but she effeminately makes me change channels. she is so loud and does not allow others to respond. I find that with most Republicans. One of these days they will blow a blood vessel. sorry charlie, but from your first comment that the "Speaker can't be the Speaker unless......" is totaly off the wall. instead of yelling at Michelle, take some time, listen, think before you engage your mouth! better yet try listening to the ridiculous route your comments take. it's like following a superball. you never know where it's goin' next. Sad state for our elected officials. Ms. Cupp made some good points tonight, but when she started to insist that the exercise of trying to defund Obamacare & threatening to shut down the government was a noble "exercise" she lost me completely. The American people aren't a testing ground to prove a point. What was that? I expected to hear a reasonable discussion about defund the Affordable Care Act or not . Instead I heard Michelle Bachman talk over,;louder, never stop talking, and completely avoid answering any reasonable question asked of her. The hosts of the show need to set ground rules to make the guests listen to each other, let each guest talk and not have one person dominate the discussion by talking louder, endlessly and not stopping and making senseless comments that were intended to deflect the question and not answer it. I'll be glad when Mrs. Bachmann exits the national stage. The scary thing is it is people like her driving the debate from the republican site. Good God! The show needs to have some sense of integrity. Wont see me watching anymore. "For the people by the people" should be changed to "for the few by the people". What makes congressman and women, police officers, members of the Arm Forces, fireman and others with the medical insurance sponsored by the Fed or State so special? We all pay for it, we should all have it. All Republicans in US Congress, put your money where your mouth is. Want to defound Obamacare ? Great! All of you need to decline Fed sponsored coverage you voted for yourself and buy your coverage like every one else. I will not watch crossfire when Michel Bachman is a guest, She is arrogant, rude and a pain to listen to her screaming over everyone to spout her nonsense. Charlie was more than polite to her even though she tried her best to shut him out of the conversation. Somebody should tell her she needs to shut up and give a chance for the other opinions to be aired. Very few sane people can stand to listen to her for more that 1 minute. She is devious and will not answer a question honestly. PLEASE no more Bachman we heard enough from her the last time she ran for election. What a humbug. Why does CNN think that participants simultaneously shouting at each other is either interesting or entertaining? Still waiting for Bachmann's answer to the questions. CNN did not serve their viewers by allowing that clown show, fiasco to go on. If Van and S.E. can't take control of the conversation when needed, you should fire both of them and give a competent person the chance! Bachman is a disgrace and was annoying to no end. Get it together. Why in the world would you put Bachmann on any show except The Three Stooges. She is so stupid it's not even entertaining. If I were Charlie Rengel I think I would have gotten up and left. She is so ignorant and knows absolutely nothing. Really Michele Bachman. She is the worst person ever. Charles Rangel said it best: "Do you know how many horses died when Ford introduced the first car?" Michelle Bachmann has a big mouth! Shut up! Why are the Dem. Reps on the show all black and the Rep Reps are all white? Are they not white Dems and Black Rep? Guess what day it is? Dumb Day! Yeah! Oh Boy! Anything featuring Michelle Bachmann is stunningly hilarious. This is a must-see! Face it, Obama is no leader !!!!! Hey Clauss! Who the heck was talking about Obama??? I said Bachmann was a hoot in any show. You must be from the Bachmann camp: Ask about the cost of tea in China, Answer with the temperature of spit in Wichita. Will Bachmann be arriving on her broom?